The biggest city in South America and one of the three largest in the world, São Paulo is considered one of Latin America’s most important industrial and financial centers. It is the industrial center of Brazil, responsible for over 30% of Brazil’s annual GNP and headquarter to the majority of Brazilian and multinational corporations. Strong industrial development and cultural diversity have provided São Paulo with the largest, most cultured and educated middle class in Brazil. São Paulo can be an intimidating place, but if you like big cities, it offers the excitement and nightlife of one of the world’s most dynamic. Attractions include the baroque Teatro Municipal, Niemeyer’s Edifício Copan, the Museu de Arte de São Paulo (MASP) and the 16th-century Patío do Colégio. Since 1991, Fast Forward has been devoted to providing high quality and personalized Portuguese courses in Sao Paulo for foreigners. All of their teachers are professional and experienced native Portuguese language instructors, university graduates and trained in Fast Forward’s direct approach to Portuguese language teaching. The Portuguese language enjoys a lively and varied lexicon throughout the world today. Fast Forward is unique in its intimate approach to acquiring language through total cultural immersion. Fast Forward currently offers Portuguese courses in Sao Paulo, Brazil, Maceió, Brazil and in Porto, Portugal. 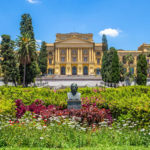 Each of these cities offers a unique experience in the modern life of the Portuguese language and the people who natively speak it. Portuguese Courses at Fast Forward focus on communication; beyond grammar books and written exercises, their teachers incorporate a variety of oral and listening elements with up-to-date technology to stimulate a comprehensive concept of the Portuguese language. Students are encouraged to interact with their classmates, their teachers and the entire staff at Fast Forward. Teachers also dedicate their creativity and time to the organization of various activities during the students´ free time and weekends. Enthusiastic and experienced host families also contribute greatly to students´ lives and well-being. Fast Forward will issue certificates of course completion for those students who have maintained regular attendance and who have complied with the requirements of their curriculum. Important notes: All course prices include: School registration fees, Portuguese language lessons as listed below PLUS accommodations with a host family and 2 meals per day except where indicated! Alternate accommodations (hotels/pousadas) are available on request. Airport pick-up is available at USD 110 each way. Materials are included in prices. Group Intensive Portuguese Language Courses: 20 Portuguese lessons per week. 4 Portuguese language lessons (50 minutes each) daily of group instruction, Monday through Friday. Groups will have a minimum of 2 and maximum of 6 students. In case of only one student enrolling, the student will have 3 classes of 40 minutes. Classes are held Monday to Friday morning or afternoon . The school closes on official holidays. All prices include accommodation with a host family, single room and half board (2 meals). New Option: Group Intensive Portuguese Language Courses – Course Only (no accommodations): 20 Portuguese lessons per week. 4 Portuguese language lessons (50 minutes each) daily of group instruction, Monday through Friday. Groups will have a minimum of 2 and maximum of 6 students. In case of only one student enrolling, the student will have 3 classes of 40 minutes. Classes are held Monday to Friday morning or afternoon . The school closes on official holidays. Group Super-Intensive Portuguese Language Courses: 30 Portuguese lessons per week. 6 Portuguese language lessons (50 minutes each) daily of group instruction , Monday through Friday. Groups will have a minimum of 2 and maximum of 6 students. Classes are held in the morning and afternoon. In case of only one student enrolling, the student will have 6 classes of 40 minutes.All prices include accommodation with a host family, single room and half board (2 meals). New Option: Group Super-Intensive Portuguese Language Courses – Course Only (no accommodations) : 30 Portuguese lessons per week. 6 Portuguese language lessons (50 minutes each) daily of group instruction , Monday through Friday. Groups will have a minimum of 2 and maximum of 6 students. Classes are held in the morning and afternoon. In case of only one student enrolling, the student will have 6 classes of 40 minutes. (All programs: NO application fee. A non-refundable USD 100.00 deposit is required at the time of enrollment. Deposit will be subtracted from final program invoice. See Application Procedures). All prices include the school's registration fee. **Important notes: All course prices include Portuguese language lessons as listed above PLUS accommodations with a host family and 2 meals per day except where indicated! Alternate accommodations (hotels/pousadas) are available on request. Airport pick-up is available at USD 110 each way. Materials are included in prices. Starting Dates for Group Portuguese Courses in Sao Paulo: Group courses for all levels (including beginners) start every Monday! National Holidays 2019: 1 and 25 January, 4, 5 and 6 March, 19 April, 1 May, 20 June, 9 July, 15 October, 15 and 20 November, 24-25 and 31 December. Group classes missed due to holidays are NOT made up, except when two holidays fall in the same week, in which case classes missed for one of those days will be made up during the rest of the week. Private classes missed due to holidays ARE made up during the rest of the week. Minimum registration for all students is one week. Any group or private instruction may be combined with courses on Brazilian history, literature, cooking, and dance. Fast Forward VIP Intensive Portuguese Courses: 20 Private Portuguese Lessons per week (4 classes of 50 minutes daily of private instruction, Monday through Friday). Classes may be held in the morning or afternoon. These courses are offered for both beginner and advanced levels and refresher course. The Portuguese language course can be adapted to the students or companies’ needs. All prices include accommodation with a host family, single room and half board (2 meals). New Option: Fast Forward VIP Intensive Portuguese Courses – Course Only (no accommodations): 20 Private Portuguese Lessons per week (4 classes of 50 minutes daily of private instruction, Monday through Friday). Classes may be held in the morning or afternoon. These courses are offered for both beginner and advanced levels and refresher course. The Portuguese language course can be adapted to the students or companies’ needs. Fast Forward VIP Executive Portuguese Courses: This course is ideal for professionals who don’t have very much time available and need to learn as much as possible in one or two weeks. 30 Private Portuguese Lessons per week (6 classes of 50 minutes daily of private instruction, Monday through Friday). Classes are held in the morning and in the afternoon. It includes lunch with the teacher. The course can be adapted to the students or companies’ needs. In this course students may take at least 2 classes outside the school. For instance visits to Shopping Malls or other places the students might wish to visit with the teacher. All prices include accommodation with a host family, single room and half board (2 meals). New Option: Fast Forward VIP Executive Portuguese Courses – Course Only (no accommodations): This course is ideal for professionals who don’t have very much time available and need to learn as much as possible in one or two weeks. 30 Private Portuguese Lessons per week (6 classes of 50 minutes daily of private instruction, Monday through Friday). Classes are held in the morning and in the afternoon. It includes lunch with the teacher. The course can be adapted to the students or companies’ needs. In this course students may take at least 2 classes outside the school. For instance visits to Shopping Malls or other places the students might wish to visit with the teacher. Fast Forward VIP Super Intensive Portuguese courses: 50 Private Portuguese Lessons per week (10 classes of 50 minutes daily of private instruction, Monday through Friday). Portuguese language private instruction combined with business terminology for the working professional. Classes are held in the morning and the afternoon. The Portuguese language course can be adapted to the students or companies’ needs. It includes lunch with the teacher. All prices include accommodation with a host family, single room and half board (2 meals). New Option: Fast Forward VIP Super Intensive Portuguese courses – Course Only (no accommodations): 50 Private Portuguese Lessons per week (10 classes of 50 minutes daily of private instruction, Monday through Friday). Portuguese language private instruction combined with business terminology for the working professional. Classes are held in the morning and the afternoon. The Portuguese language course can be adapted to the students or companies’ needs. It includes lunch with the teacher. The school has an active and exciting social program. Included are visits to theaters, concerts, restaurants as well as other events such as national festivals, sporting events and dance clubs. Fast Forward arranges these activities at least twice a week Students are responsible for their own transportation expenses, entrance fees as well as their own consumption when going out to restaurants. Mercado Municipal: The Municipal Market is one of the largest distribution centers for fruits, vegetable, fish and all sort of local and imported goods. Rua Vinte e Cinco de Março: Rua 25 de março is one of the most traditional streets in São Paulo. There you can find knickknacks and trinkets galore of all types and all prices. Centro de Tradições Nordestinas: The Center for Northeastern Traditions brings the Northeastern community together during weekends with regional music attractions, rustic restaurants that serve the best northeastern food and bars named after every northeastern state serving typical food and drinks. Embu das Artes: Embu das Artes has history, legends and art linked to the formation of the Paulista people. Artists here recreate the past and form the future with very diverse materials. 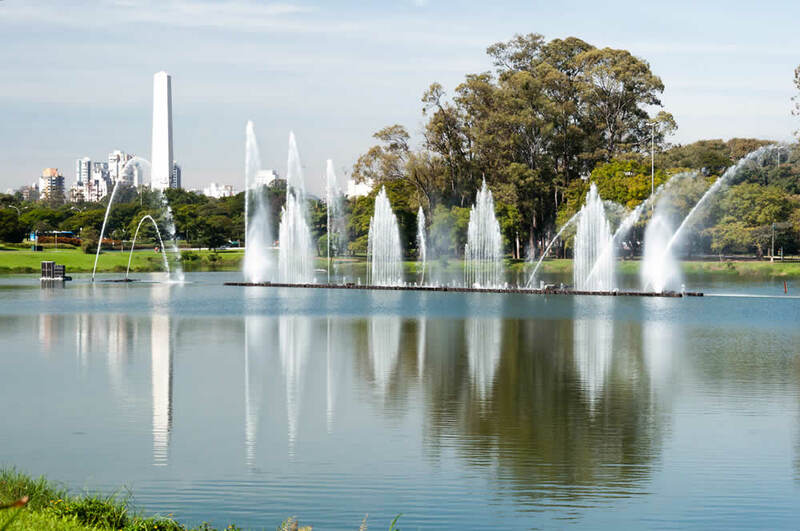 In addition, this city has a rare natural beauty between the municipalities and the metropolitan region of São Paulo. Since 1950, local and outside artists have made Embu their abode. Bairro da Liberdade: São Paulo has the largest number of Japanese living outside of Japan. O Bairro da Liberdade is the most Asian influenced section of São Paulo, as it is the principal abode for the Japanese people. MAM – Museu de Arte Moderna: The Modern Art Museum of São Paulo was founded in 1948. 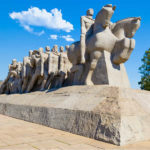 Situated in the Parque Ibirapuera, it is composed of two exposition rooms in which presentations of Brazilian and international, modern and contemporary art are shown. Also, the Projeto Parede, which showcases works by Brazilian artists, is shown in the space linking these two exposition rooms. The museum collection, composed of about 3,700 works of modern and contemporary art, is also found in this building, where guided tours to the expositions and artistic activities are offered by Educativo MAM. MASP – Museu de Arte de São Paulo: O MASP was inaugurated on October 2, 1947, by Assis Chateaubriand, founder and owner of Diários and Emissoras Associados and by the professor Pietro Maria Bardi, journalist and art critic in Italy. Lina Bo, modern Italian architect and wife of professor Bardi, designed the architectural structure of the MASP building. 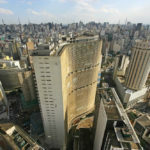 The land on Avenida Paulista was given to the city on the condition that the view to the center of the city would be maintained. Amongst various art schools represented in the MASP collections are those of Italy, France, Spain, England, Germany, Mexico and much more. 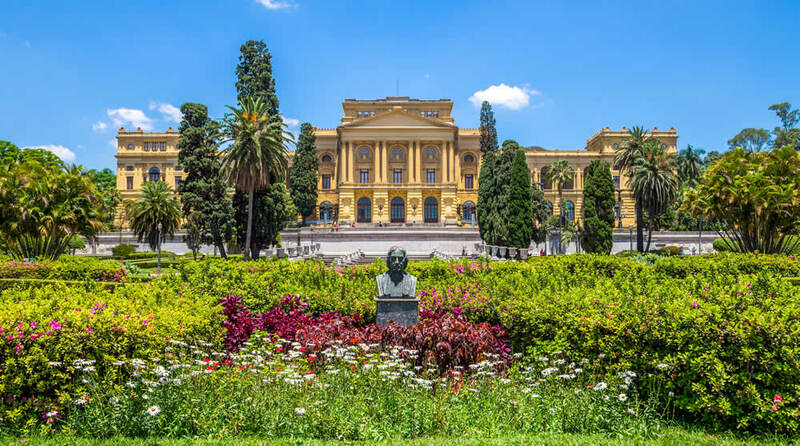 Museu do Ipiranga: This museum, which opened in 1895, shows furniture, weaponry, domestic utensils, photographs, ceramics/dishes and historic paintings from the independence era of Brazil. Terraço Itália: This is the tallest building in the city. It is 165 meters high, with 46 stories. It was built in the early 60’s and inaugurated by Queen Elizabeth II. 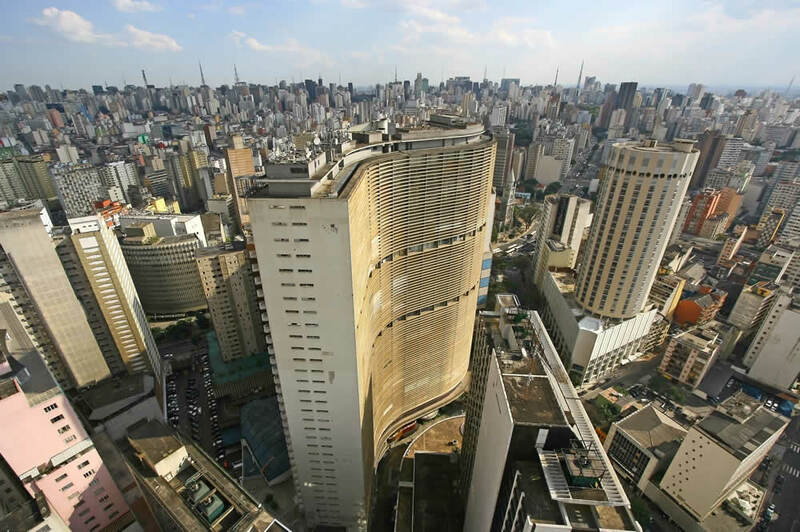 On the 46th floor there is a restaurant, called the ‘Terraço Itália’, from where it is possible to see all of São Paulo. Airport Transfers: From Sao Paulo Airport: USD 110 each way.